Happy Father Day all Fathers out there!! Big love to my dad!!! Have a blast!!! Today I thought I would share my handbag essentials!! I have always loved watching 'What's in My Bag' videos on Youtube, it might be because I am a nosy person but I find it so interesting. I always find that you can find a lot about a person from what is their bag. Number one. Make-up bag!!! I will walks carry my make-up bag with me wherever I go!! It's my holy grail and I can't leave without it! 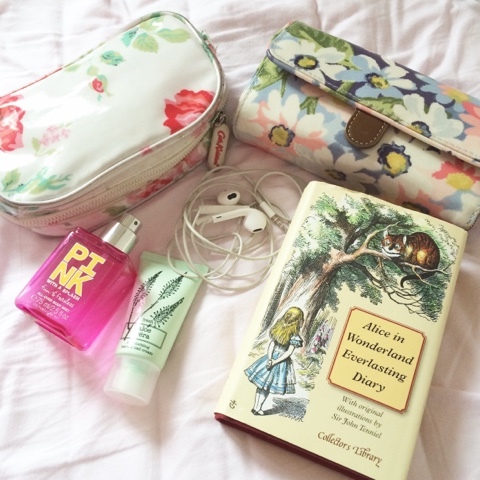 I did a blog post about what is in my make-up bag! (here). Number Two. Purse!! Again I cannot leave the house without my purse!!! I feel lost without it! I recently purchased this purse from Cath Kidston. Its the Painted Daisy Folded Zip Wallet I am in love with it, the colours are perfect for the summer. It has quite a few pocket areas which makes it is super handy. Number Three. headphones. What else can you do when you are sitting on the bus in your own, but listen to music. I have to have headphones. Again I feel lost without it!! Journeys are always slow and boring so they are a must.. These are just Apple Standard headphones! Number Four and Five. Body spray and Hand cream. This Victoria Secret Pink All over Body mist is the smell of summer. It makes me feel so summery, so having it in my bag helps me stay fresh. Hand cream is also a must. I've mention it in a few posts but I love to carry Hand cream with me. It helps to moisturise my hand as well as keeping my nails strong. It doesn't have an over powering scent so it it to put it on in public. Lastly Number Six. My diary. I find it is very useful jotting down my work schedule or date for the diary. This diary is special as my parents gave me it as a Christmas pressing last year. It is so pretty and what make it better it lasts for ever. Hope you having a great day, like I said I have a few travel/ holiday ideas, so stay tuned? Let me know what is in your bag?